The fruit, which is mostly consumed fresh or as juice, is rich in vitamins A and C and it also has iron, and has high fiber content. The taste varies from sour to sweet, one way of distinguishing the sour variety from the sweeter ones is that the former has narrower ribs, while the latter have thicker, fleshy ones. 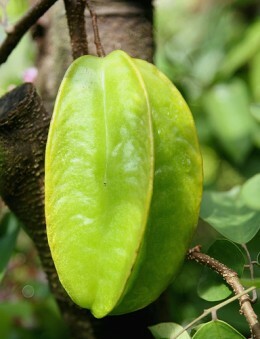 Unripe star fruit is preserved in many parts of Southeast Asia and is used as a traditional remedy. Star fruit may lower cholesterol levels and add bulk and moisture to feces. A decoction of leaves and roots (prepared separately or in combination) can help cure headaches, ringworm, and chickenpox. The fruit is known to cure hangovers and prickly heat. You can also use the pickled fruit for hangover just take one piece of the pickled fruit, steam in water and serve. The fruit has also been used to treat sore eyes. The star fruit is given to nursing mothers as it is commonly believed to stimulate the flow of milk. For sunstroke, a piece of the sweet variety is recommended. For nausea and indigestion eat half piece of the fruit and repeat after 3 hours. Its high vitamin C content can help ward off winter colds and flu. It is recommended as diet fruit because of its high fiber and low calorie content. Star fruit is also full of antioxidants and flavonoids. Buying Tip: Look for shiny yellow star fruit that are without bruises and are not too soft. Ripe starfruit should be used as soon as possible.